The Art of Adventure is a photography-driven compendium of the world of outdoor adventure, highlighting backpacking, rock and ice climbing, camping, mountaineering, skiing, trail running, surfing, free diving and more, including insights from the editors of leading magazines including Outside, Ski, Climbing, Backpacker, Trail Runner, and Canoe & Kayak. The fastest growing form of recreation today, outdoor adventure sports compel countless individuals to push the boundaries, challenge the elements, and seek out the world’s most beautiful and remote regions. 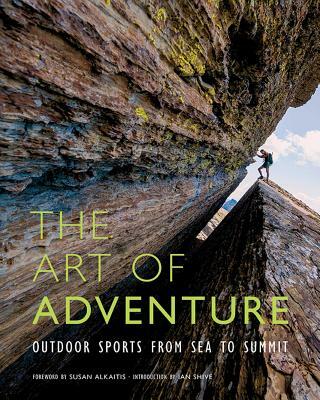 Rock climbing the coastal crags of Southeast Asia, free diving the freshwater caves of Mexico’s Yucatan Peninsula, surfing a reef pass in the South Pacific, and skiing an untouched alpine chute are among the many lifestyle-defining, adrenaline-pumping pursuits chronicled in this one-of-a-kind, comprehensive volume. Through firsthand accounts by photographers and explorers, breathtaking photography, and contributions by leading commentators—including Keri Bascetta (SKI and Skiing), Amy Silverman (Outside), Julie Ellison (Climbing), Genny Fullerton (Backpacker), Aaron Schmidt (Canoe & Kayak), among others—The Art of Adventure reveals the culture, inspiration, and drive behind those dedicated to living an adventurous life. Complete with insights from behind the lens and far afield, this riveting collection captures the spirit of outdoor recreation like never before. Filled with wisdom and colored by both epic and quiet moments, The Art of Adventure is a gripping reminder of the vast playground awaiting those willing to live on the edge. Ian Shive is an award-winning conservation photographer, author, educator, film producer, and environmental advocate, most recently recognized as the recipient of the Sierra Club’s 2011 Ansel Adams Award for Conservation Photography. Shive’s images have appeared in publications around the world, including National Geographic, Time, Ski, Travel Channel, Gourmet, The New York Times, the Los Angeles Times, US News and World Report, Popular Science, Men’s Journal, Outside, and hundreds of others. Often referred to as the leading chronicler of America’s national parks today, Shive has helped shape diplomacy efforts around the world through his Wilderness Diplomacy initiative, currently underway in Afghanistan, and his best-selling book, The National Parks: Our American Landscape. He lives in Los Angeles.